It’s literally been hundreds of years since one of Scotland’s greatest poets passed away, but Rabbie Burns lives on through our love of haggis and belting out Auld Lang Syne when we’ve had one too many drams of the good stuff. To kick off his birthday celebrations we’re turning history on its head and thinking about what he’d be up to if he was living today. Our Robert was a bit of a ladies man back in the day and had 12 children, just nine of them were to his wife Jean Armour. In 2019 he’d be flirting with women in line at the latest vegan independent coffee shop and Britney Spears’ Womaniser would be his anthem –#throwback. It’s likely Jean would have realised a man shouldn’t treat her like that and blocked his number, all after she saw him kissing some wee lassie on his pal’s Snapchat story over Christmas while she stayed in with the kids. He would be known for having good patter on Twitter but get hate from team Jean supporters when he posted photos of his other children with #family. Before his poetry really took off, Rabbie was going to move to Jamaica. He decided against it after his poetry collection Poems, Chiefly in the Scottish Dialect was published and moved to Edinburgh instead. In the modern day he would probably have told his pals he was moving to Malia to become a club promoter for the last three years and hit up Buchanan Street as a busker on the weekends. After being noticed by Ed Sheeran’s record label he would be an instant hit and become best pals with Lewis Capaldi or Gerry Cinnamon. Despite having a massive online following and recently collecting his one million play button for his YouTube channel, he’d probably still constantly remind people of that time he was named the Greatest Ever Scot by STV. After making it big he would’ve still moved to Edinburgh and had DJ sets at Hive on Saturdays. Rabbie worked in the civil service and had some pretty radical political views. Nowadays he’d be outspoken about Brexit on social media but want to keep up his career and end up releasing a spoken word mixtape of his poetry. It would feature a collab with Nicola Sturgeon and talk about conspiracy theories of what the government is hiding from us (a plan C? A secret Theresa May takedown? Aliens?). 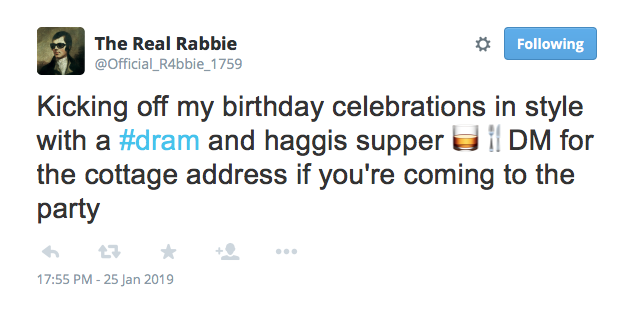 One thing’s for sure – if Rabbie were here today he’d be buying in the best haggis, neeps and tatties and sitting down with a dram at dinner tonight. Are you following Source on Instagram and Twitter? Make sure you do for all the latest updates and advice.